The first principle of life found in creation is to know there is only one God who is the Creator of the universe and of all things created. Apart from God nothing was created, it was by him all things were made and without him nothing remains in existence: Even the human experience is sustained by God, our success and failures are all under God’s supervision, and He will not forsake His creation. He has in Christ restored us in His love and power forever, and have re-established the kingdom in Christ our head and King to come. Although this is a hard thing for many to accept, for the sons of God both those who are and those yet to come this is a reality. We have in us the witness of God’s Spirit that we are God’s children and in time to come He will establish His kingdom forever. To confirm His promise He made an oath by himself as there was no other God by which He might make an oak, for He was God alone. That confirmation was manifested through the man Jesus Christ whom He sent in His likeness full of power and might whose blood was shed as the confirmation of God’s oath and promise. For when God made promise to Abraham, because he could swear by no greater, he swore by himself, Saying, Surely blessing I will bless thee, and multiplying I will multiply thee. Hebrews 6:13-14. Through Jesus Christ the Son of God, God has confirmed His promise to Abraham who trusted God. Even before the confirmation was sent Abraham trusted God until the appointment was fulfill in Jesus who came into the world, died on the cross and rose again. 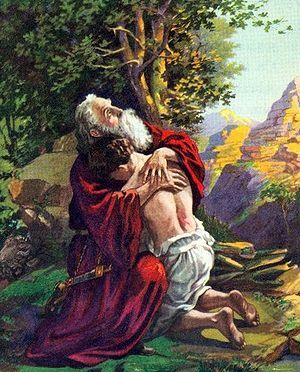 Abraham is a light and an example to us of God’s faithfulness. Looking back at the relationship between God and Abraham we have a clear view of God and who He is in nature and character. He is a God worthy of our praise on account of His faithfulness to Abraham. Abraham trusted God, and as a result God credited Abraham’s faith to Abraham as righteousness. God came in the form of humanity and in keeping with His promise to Abraham died, rose again confirming the promise He made with Abraham. The demonstration of Jesus’ resurrection was God’s answer to Abraham’s faith in God, and the demonstration of God declaring He was God and the only one in all of creation we must serve and trust. He has through the light and life of Jesus Christ provided us with the evidence we need that there is one God, one Lord, and one Creator. God the Father has made Jesus the head of His brethren and the life of men. So now when we say there is only one God, we can point to the evidence and relationship of God and Abraham, showing that the God of Abraham was the only God to have kept His word with the sons of Abraham in raising Abraham from the dead in Jesus Christ. When we say Jesus is the only way, we can point to the fact that He was the one who came giving his life honoring God’s word to Abraham. And when we say God is worthy of our praise and no other God, we can point to the fact that out of all the gods who existed in the world and worshiped by men only the God of Abraham provided for the redemption of humanity and have kept His promise to the man He made that promise. The character of God has been proven through the love of God to have sent His son to die for the offense of the world, according to His promise to Adam, Abraham, Isaac, and Jacob who trusted in Him. The Life of Jesus was given to us that we might know God, that we might abide in God, and that we might be raised up in Him. God has proven himself to be God the Creator of all things demonstrated in His word.